Sweet Evelyn is from the Mayuge district. Sadly her mother is unable to care for her & she lost her father years ago to AIDS. 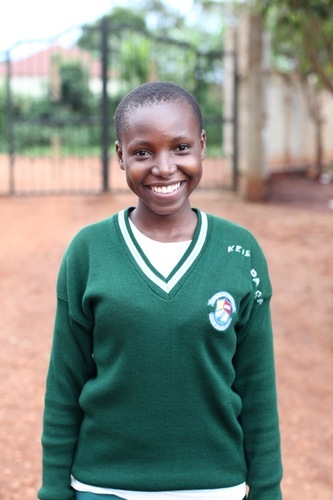 Currently she lives with one of our amazing staff members, David Wafula while she goes to school. Evelyn is an incredibly hard worker. Joy from the deepest parts of her soul just seems to bubble over, she’s lovely (just look at that pretty smile). Let’s work together to help her finish her higher level schooling & accomplish her dream of becoming a nurse. We are so proud that she has chosen to go into a profession that helps others (& one in dire need in Uganda). We are doing everything we can to provide the amazing young people of ROWAN with hope for the future. Anything you can do to help, whether it is a one time donation or sponsoring someone directly is a gift that goes directly to those in need. To learn more about sponsoring Evelyn, please visit her sponsorship page. Next PostNext Why Build a Hall?